“What has happened to me has actually served to advance the gospel.” With a heart for Jesus and a passion to reach the lost, nothing can get in the way of our pursuit to carry the gospel throughout Cambodia. 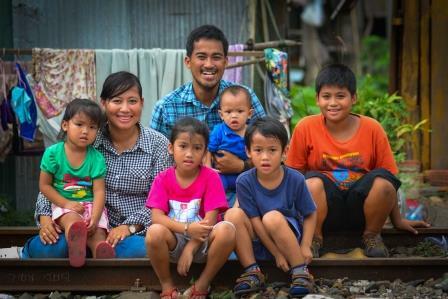 My name is Koy Chhim and with my beautiful wife, Reny, in September 2014 we launched our ministry Cambodian Care. This God-size dream has not come without; bold faith, burdened hearts, unforeseen courage, His provision, sacrificial compassion, focused dedication, much prayer, and total dependency on Jesus Christ. We knew that God had a plan for this nation and we wanted to see His presence all over Cambodia, so we went, unbeknownst to what was ahead, for the gospel. Our journey began after we resigned from a well-known ministry we had worked at for six years. Through various experiences and roles enabled us to acquire skills for; church planting, leadership training, organizational development, and above all a burden to make a difference. After visiting one of the most poverty-stricken communities in this nation, our hearts were broken and our vision became benevolence for women and children, especially for poorest communities. It is that day we agreed to be committed to starting something new, something better, something that will empower children and women. This day at the train tracks is a day we will never forget. We felt laden for this community. It presented children by the hundreds, barely clothed, lacking food and an opportunity for education, and both disadvantaged women and children desperate for Hope. A desperation that led children to drink sewage water daily and eat leftovers unwanted by others. Our souls felt compassion for these people and for the starving little boy left unnoticed on the train tracks. This little baby boy, under one year old, impressed on us a commitment to step out of our comfort zone. This day stirred our hearts and we knew God was leading us onto greater things to make a greater impact. Thankful for all that our past positions taught us, we stepped out in bold faith, thus, our journey began. We knew this would be no easy transition. We had a vision, but were leaving an income and trusting God for His provision. It took unforeseen courage to trust that God would indeed provide for our family of seven. We have five wonderful children; Daniel, Hannah, Samuel, Dabbie, and we are grateful to have adopted the little baby boy on the train tracks, Moses. This is our family that we love so dear, but it did take full trust in His provision for us to start a ministry from scratch and still have food for our family. Reny and I started Cambodian Care from sacrificial compassion that led us to ask God for only His excellence. We started with hopes to welcome six components into the poorest villages throughout Cambodia. These six things include: school, church plant, teen discipleship training, nutritional program, child support program, and thriving businesses to create job opportunities as well as self-revenue for the ministry. Compassion has undeniably been the driving force for us as leader to meet the physical and spiritual needs of the people here. Compassion that energizes our nutritional program, that is active to help to feed hundreds of students in two villages. Compassion to believe that we will provide rice, milk, deworming pills, instructions on how to wash hair and brush teeth in 200 villages, compassion to make disciples, and above all else compassion to shine the light of Christ to all poorest communities. As founders we had spent much time in prayer. This gained us a focused dedication that led us to start construction in October 2014 on our first school in a village called Toulpongror. Diligently every day we sowed seeds alongside the zealous students who helped us in the building process. Every day as we watch the beginning of Cambodian Care unfold and it was proved; "There is no one holy like the LORD; there is no one besides Him; there is no Rock like our God.” 1 Samuel 2:2 He is far greater than our dreams. My wife and I have dared to ask for the things that are exceedingly and above all that we could ask. (Eph. 3:20) Since the first school started at the beginning of November, 2014 we have continued to see God’s favor as we move forward to trust only Him. Over two hundred students attend our first Light of Future School, Monday through Friday. About 25% of the students that attend are the very ones that were fervent in labor to build their own school. We are certain the best is ahead for these brilliant students and only the beginning of the legacy Cambodian Care will leave in this generation. Since then we have enrolled over 198 students to attend our second school at the “Train Track village.” Every Sunday we meet in Toulpongror for our first church plant, where students lead worship and kids are eager to learn about Jesus. Every Sunday we see God’s power as His presence is there and His healing is perfect. We have seen prayers answered and the poorest communities glorify God above else. Once a week we meet to disciple 35 teenagers who have so proudly confessed, in this Buddhist nation, they believe in Jesus 100% to be the true God. The Holy Spirit is tangible as our own prayers have been answered and we continue to see people come to know Christ. Over 80 people in February, 2015 were baptized. Continually we see Jesus do what only He can do, in the lives of everyone we meet. This is still only the launch for me and my wife, and we are dedicating to advancing the gospel and to see more church plants and to make disciples. We are leaders who can’t sit and watch as others invest in this nation. We can’t afford to let our country and the people we meet go to hell. We won’t let opportunities slip by us to advance the gospel to every crevice of Cambodia. Reny and I started Cambodian Care to see Christ above all in this nation. It is certain that there is less than 2% Christian in the whole country of Cambodia, which is why we are burdened for the lost and eager to reach the poor. Our total dependency on God in this journey has been quite an adventure and we know it can only get better from here. We know that God is big and we seek God above all else to fulfill His dream. His dream that has lead Reny and I to cling to, bold faith, burdened hearts, unforeseen courage, His provision, sacrificial compassion, focused dedication, much prayer, and total dependency on Jesus Christ. We never forget our friends’ prayers, loves and supports to be part of this journey that together we can make a greater impact for the kingdom of God.